Whenever we photograph our subject on an angle, we get what's called keystone distortion, or keystoning. This means that, rather than the edges of our subject looking straight and perpendicular, they look as if they're leaning back or tilting inward towards the horizon. To fix the perspective, and crop the image at the same time, we can use Photoshop's Perspective Crop Tool. And in this tutorial, I'll show you how it works! 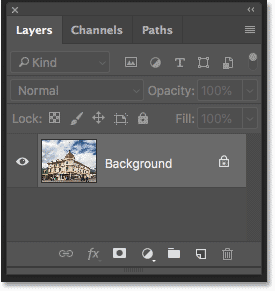 Adobe first added the Perspective Crop Tool in Photoshop CS6. I'll be using Photoshop CC here but CS6 users can also follow along. Let's get started! Photos of buildings often suffer from perspective distortion. Photo credit: Steve Patterson. Let's see how the Perspective Crop Tool can fix this problem. Click and hold on the standard Crop Tool to access the Perspective Crop Tool. Click and drag out an initial crop box around the image. The perspective grid inside the crop border. Make sure "Show Grid" is selected. To fix the perspective problem, all we need to do is drag the corner crop handles left or right to line up the vertical grid lines with something in the image that should be vertically straight. 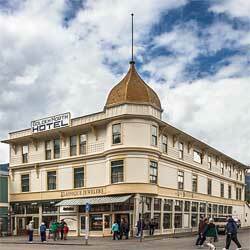 For example, with my photo, the sides of the hotel should be straight. So to correct the perspective, I'll drag the corner handles inward until the grid lines and the sides of the building are tilting at the same angles. Matching the perspective grid line with the left side of the building. Matching the grid line with the right side of the building. Adjusting the grid line on one side of your subject may throw off the other side, so you may need to go back and forth a bit with the handles. But after a bit of fine-tuning, you should have both sides of the grid lined up with something that should be vertically straight. You can also drag the handles in the bottom left and right corners of the crop border if you need to, but in my case it wasn't necessary. To fix the perspective, the shaded areas outside the crop border will be tossed away. Making further adjustments to the crop border. Clicking the checkmark to apply the perspective crop. 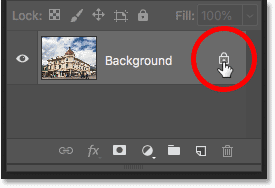 Photoshop instantly crops away the area outside the crop box and fixes the perspective problem in one shot. 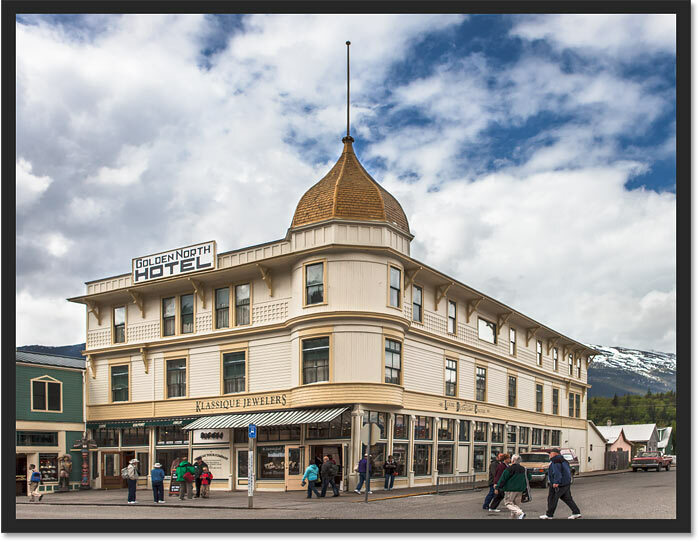 The hotel in my photo, as well as everything else that was tilted, now appears vertically straight. 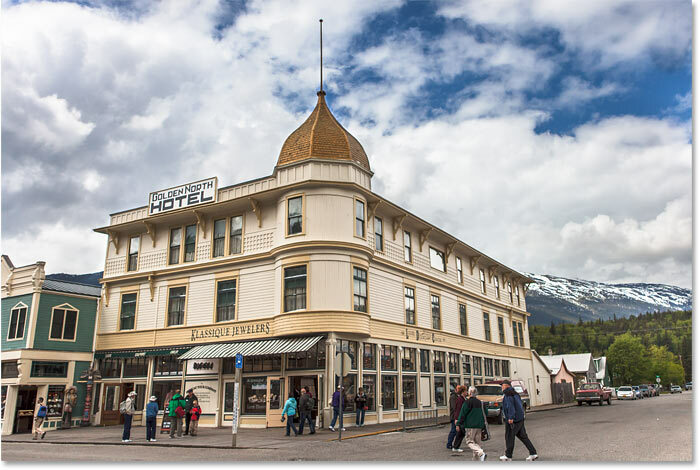 The hotel is no longer leaning backwards. One problem with the Perspective Crop Tool is that it's not an exact science. After you've applied the crop, you may find that your image still looks a bit "wonky" (technical term), and that's because the angles of your grid lines didn't quite match up with your subject. If that happens, undo the crop by pressing Ctrl+Z (Win) / Command+Z (Mac) on your keyboard and then try again. It may take a couple of tries, but stick with it and you'll get it right. Another problem you may run into with the Perspective Crop Tool is that everything in your image may look a bit vertically "squished" after applying the crop. 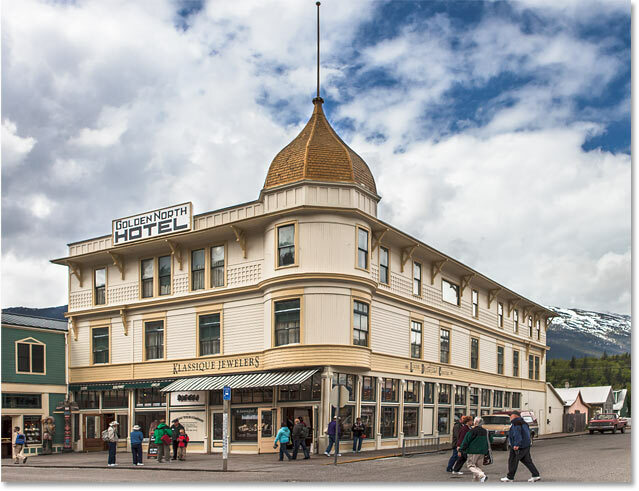 In my case, the hotel no longer looks as tall as it did originally, and the people walking in front of it all look shorter. 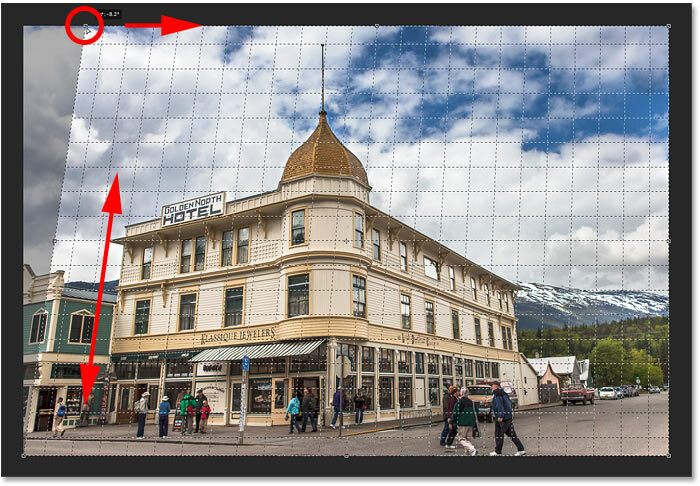 We can fix this problem by stretching the image using Photoshop's Free Transform command. Stretching the photo vertically to restore the height. Clicking the checkmark in the Options Bar to apply the Free Transform command. The original photo with the original problem. And there we have it! That's how to crop images and fix perspective distortions at the same time using the Perspective Crop Tool in Photoshop! 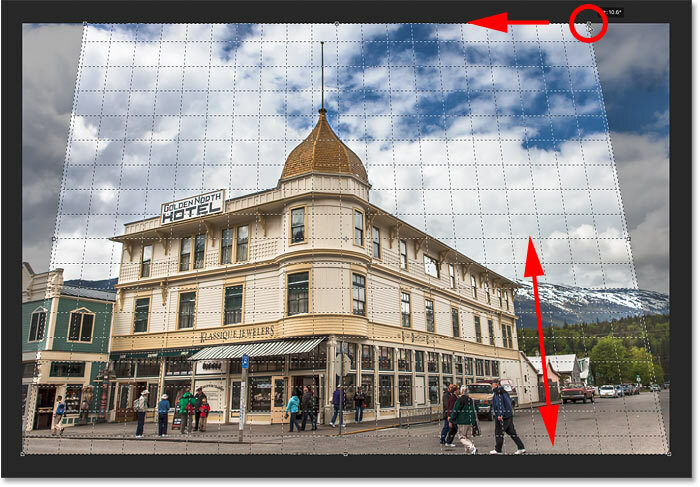 In the next lesson in this chapter, I show you how the Crop Tool makes it easy to crop and resize your photos to match any frame size you need!